Sign up for Ensemble Auditions! Spots are still open for auditions this Friday & Saturday. This musical offers great performance work and opportunities for the ensemble cast. 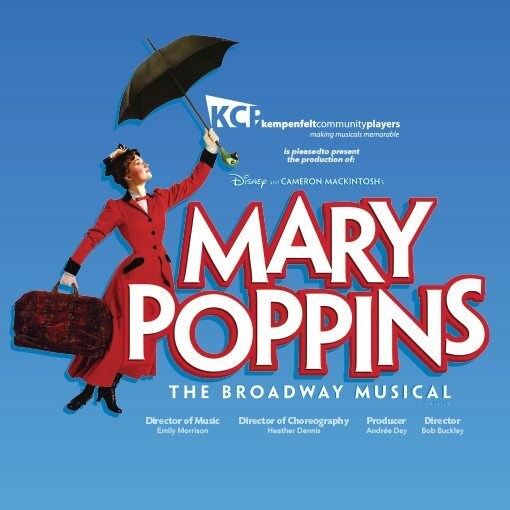 Ensemble people: “Mary Poppins” is a musical in the true sense of the word…a lot of musical numbers strung together by a story line with limited dialogue. While character portrayal (acting) is important, all the cast members selected will be expected to sing, hold a harmony line, and move comfortably in choreographed scenes. For detailed information on auditions, rehearsal schedule and performance dates, please read the audition form. If you have further questions about getting involved and potential conflicts with schedule, please email the producer to determine opportunity to get involved. To sign up for an audition, click this link and submit your form. Auditioning for lead adult and children roles and ensemble roles. Great opportunity for singers to review proper microphone and monitor use, and how to work with your technician! Sit in the audience and see 2 KCP singers with with Edwina Douglas and band, as they communicate a performance set up with workshop presenters/technicians. 2– 4pm Vocal performers interested in understanding proper use of microphones and how to work monitors and effectively work with their sound technicians will benefit greatly from this session. Registrants will view the process of singers working with technicians and band through setup with many opportunities to pose questions.